This is our rather more thorough discussion of some of the things we actually see in the reel, to give more of a sense of the visual part of the adaption, but also to give a sense of some of the characters and scenes as can be grasped from what is, in the end, a very short reel that tries to capture a large part of the plot. You can read our more general, first impressions here. We’ll be focusing on the new scenes and details primarily, so in many cases we’re skipping over scenes we’ve seen in previous trailers, teasers, and the like. However, all that said, we’ll we open with the same material as HBO’s big preview trailer, what we assumed to be the reshot execution scene. Notice Theon‘s black hair. The first new scene we see is a lovely shot of Ned besides the heart tree—it has its new face (the original from the pilot shoot can be seen and is much whiter, but alas, there is still no dried, red sap for the eyes—cleaning Ice (which looks marvelous here—the blade looks quite dark gray!) while Catelyn approaches. Something about the water and the wooded environment immediately put Linda in mind of some of the scenes in Rivendell in The Lord of the Rings: The Fellowship of the Rings. 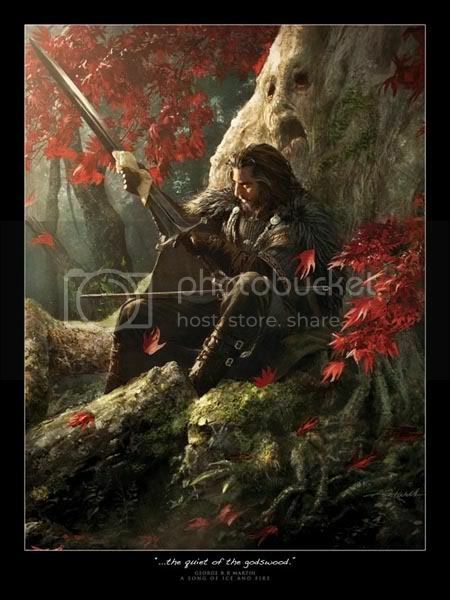 For me, the first thing I thought of was Michael Komarck‘s gorgeous painting of Ned at the heart tree. Then we have our first glimpse of the throne room, the Iron Throne, and Jon Arryn. Lord Arryn is on a bier, lying in state, with flat stones on his eyes—a custom not from the books, but it feels suitably realistic, given the ancient Greek custom of coins over the eye—which have eyes painted on them. The throne room, which I was able to wander around, is a truly impressive set! I saw the concept art for this scene in Belfast and was asked not to speak of it then. There are silent sisters with black veils attending on Jon Arryn’s body, and an interesting detail is a sort of… banner with a seven pointed star that rises from a wooden framework on their shoulders. Hard to describe. Not like the Japanese samurai’s sashimono. We don’t really know what to compare it to, but it’s certainly something that makes them stand out as devotees of the Seven. Cersei and Robert are in a new scene, and the importance of Robert having a Hand is ... perhaps over-played, but then again, Cersei’s simply trying to convince Robert to name Ser Jaime his Hand, something that we know from the book that she was in fact angling for. Robert sees through it. This gives us an opportunity to introduce Jaime, as he visits Cersei in the throne room as she watches Jon Arryn’s bier, clearly troubled. We learn that there’s a secret, something that concerns Jaime and Cersei, that they fear Jon Arryn told to others before he died. Cersei asks her brother, who’s telling her not to worry so much, if he isn’t afraid. 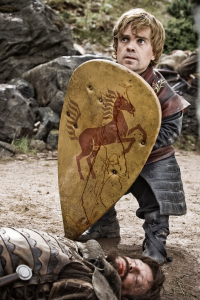 He responds: “There’s nothing to be afraid of, we’re Lannisters.” A new line, but a good one, reflecting the clannish pride of the Lions of Casterly Rock. The delivery of this line struck as a bit tremulous, sincere and perhaps just a bit frightened at the prospect of her husband saying yes. But more on this later. We see Addy now, mounted on a handsome horse (a Friesian, we believe) and then, dismounted, approaching Ned and family who are all kneeling. It’s a funny moment, when he gestures for Ned to rise, and then tells him bluntly, “You’ve got fat.” There’s a long silence, and Ned’s eyes flicker down to Robert’s belly and back up ... and then Robert breaks into a laugh, and they embrace. The straps over her shoulders are a sort of scarlet red color—very striking—while the rest of the gown seems rather golden, suggesting a clear reference to the Lannister coat of arms. In that shot, she’s watching Robert carousing with a buxom wench, and it’s clear she doesn’t care for it. She also has on an elaborate wig, and it’s quite clear that in the series, Cersei occasionally dons these things for a regal effect. There’s a lovely sort of tiara tha she wears, made of gold and with a large emerald as a centerpiece. Then, there’s the scene in the First Keep which will close the first episode. We won’t discus it in great detail, but we did want to say that, contra Hibberd, we don’t believe the line from Jaime of, “The things I do for love,” is delivered in a flippant fashion. There is, certainly, a suddenness to what happens next, something that may well draw gasps of shock and bemusement from the audience, but… Coster-Waldau’s delivery of that line seems a little more complex, given that there seems to be a distinct pause as he stares at his sister. Perhaps it’s best to say that the line can be interpreted a number of ways, and that there’s room for an interpretation that suggests a certain loathing or disgust. We then cut to a segment that focuses on the Night’s Watch. There’s a key line here, in a new scene between Ned and Jon (new in the sense that it’s not in the book, but it certainly fills in for an interaction that must have happened) as they sit on horseback at a crossroad, about to part ways: “There’s great honor serving in the Night’s Watch. The Starks have manned the Wall for thousands of years. And you are a Stark. You may not have my name… but you have my blood.” This last part will, of course, make fans happy. 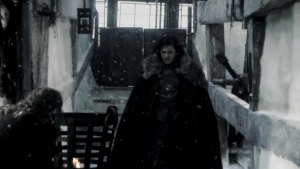 It’s a reference to a similar line from Ned, but one said many years in the past to Catelyn in Winterfell, when he chastises her (unfairly, some might think) for wanting to know more about Jon Snow and his mother. We see Benjen Stark, Eddard’s brother, on horseback as he waits for Jon. I had the great privilege of watching Peter Vaughan as Maester Aemon and James Cosmo as Jeor Mormont during filming at Magheramorne (the site of the Castle Black set) this past October, and they’re both featured in the next segment as they urge Tyrion to use his connection to Cersei to get more support for the watch. A great deal of rough gravitas and unexpected strength on display in the scene, and dire warnings about the coming winter as we cut to a shot of the frozen lands beyond the Wall… and then three tiny black figures on horses, and a huge Wall looming above them and disappearing away into the horizon. Then Catelyn’s bedchamber, and Ned and she are cozy when Maester Luwin enters with a message brought by raven in the night. A change from the books—in the novel, it’s a message that some unknown person hides in a sort of puzzle box that they leave in Luwin’s chambers. Speaking of Luwin, his gray robes look very good, very much as close interpretation of what’s described in the books. His maester’s chain, on the other hand, is visually striking but very different from what’s in the novel—a great loop of wide links, hanging down to the waist, rather than a close-fitting collar. Why the change? The visual, we assume. It’s certainly what I first thought when I saw this on Vaughan in Belfast. Combined with her first stating that Ned need not accept the role of Hand, it seems very clear to us that this scene has been rather radically re-envisioned from the books. There, Catelyn is the voice who urges Ned to go, and he is the one who does not wish to do it. She pushes him to do it because of the great honor, the elevation of Ned to the role of the second most powerful man in the realm, and to see her daughter become betrothed to Prince Joffrey and one day be queen. “Family, Duty, Honor,” are the Tully words, and Catelyn lives by them. She is a woman who wishes the best for her family, but what’s best is not necessarily what’s most comfortable for her—she’s ready to give up being with her husband for months (even years) at a time, and even some of her children who’ll accompany them, because she wishes the honor due the great man that is Eddard, but Ned shies away from it despite the fact that his best friend, the man who’s like a brother to him, is in mortal danger. This facet of Catelyn is an important feature of her character, a nuance that complicates her and makes her more realistically drawn. She is not Lady Macbeth (or Queen Cersei, for that matter): though she has ambitions for her family, she seeks them through honorable means, and in this medieval-esque setting this is an accepted thing, the proper aspirations of a dutiful and loving lady. “Family, Duty, Honor.” They won’t quite have the same ring when they come out of the mouth of this interpretation of Catelyn. 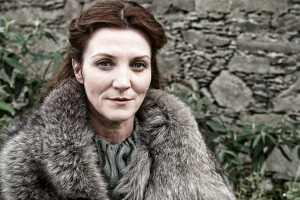 We hasten to add that this is no reflection on Michelle Fairley—she does a magnificent job playing Catelyn as the screenwriters have written her. And we’ll emphasize that this amounts to perhaps a minute of disjointed footage, and it could be that with more context we’ll see Catelyn given a more ambiguous position again, although we find it hard to reconcile these very bald, straightforward lines with that. We should also acknowledge that, yes, the specific line seems remarkable. Half his life fighting for Robert? 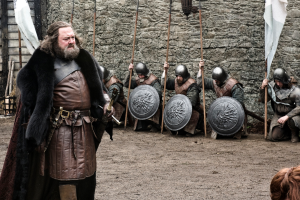 Ned fought in two wars for Robert in the books, wars that perhaps lasted two years (at most) between them. Are we to believe that they’ve decided to make the recent past of Westeros far more violent, or is this to be taken as hyperbole on Catelyn’s part? And then, our first look at King’s Landing. It very closely matches concept art I saw while at the production office in Belfast. The Red Keep is stunning, and I’m fairly sure the Great Sept of Baelor is also present. It appears to me that they’ve taken an aerial shot of one of the coastal, medieval towns of Malta and then digitally added a peninsula and a broad hill on which the Red Keep stands. Massive. While it stands on a hill, clearly, it’s not quite Aegon’s High Hill (Visenya’s and Rhaenys’s hills are not apparent)... but the Red Keep more than makes up for it. It’s a towering structure, very likely taller even than what GRRM describes. John Howe’s depiction for A Clash of Kings gets a sense of the massiveness, though it’s much blockier than this version of the castle with its soaring towers. They are not getting away from the fantastical element of George’s castles, not by a long shot. If we’re so lucky to get a season 2, we can’t wait to get our first look at Harrenhal, a castle which makes other castles look like toys. After Eddard arrives in the Red Keep, we next see him in the throne room. Massive open space, great columns, and the Iron Throne. “How many kings arses have polished it, I wonder?” Jaime asks as he comes up to Ned. Eighteen, as it happens. Plus any number of Hands and the occasional regent, a PR executive for HBO, GRRM, Parris, a certain website admin… The Iron Throne’s great, a big ugly piece of gray iron made from swords. One thing to note: this shot seems to be deliberately made to emulate Ned’s memory of entering the throne room and finding Jaime seated on the Iron Throne, Aerys’s body at the base of the dais, at the end of Robert’s rebellion. This time, Jaime’s seated nonchalantly on the dais itself (perhaps we’ll find he’s sitting on the exact place where Aerys’s body fell), not taking his duties very seriously. Some sniping follows, in which Ned seems to get the better of the Kingslayer. Ned’s propensity to verbally spar with Jaime is a new thing (for one thing, there’s only ever one direct interaction between the characters in the novel), but we take this to be all about how Jaime is uniquely capable of getting under his skin. And now to Bran’s bedchamber, which is handsomely decorated with all sorts of touches that make it seem a real bedchamber in Winterfell (I’ll have more to say in my set visit report). 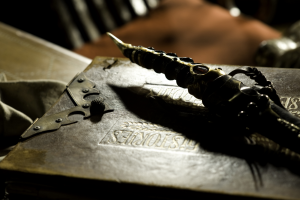 We have a great look at a certain dagger, with a wickedly-long, curved blade. This is a departure. as in fact it’s supposed to be a very understated weapon despite the great cost of the materials its made of, but we’re told that the producers wanted something that was so important to stand out visually. This scene is very close, but not quite, the same as in the books, and it plays very well. The scene ends with Summer leaping into the fray. Then we have Catelyn speaking to the household (Robb, Theon, Maester Luwin, and Ser Rodrik Cassel) about what had happened. This is the scene that EW teased as being moved from Catelyn’s bedchamber to the godswood. The thing that leaped out at us here is that Theon . . . is blond again. What’s going on here? We saw him appear black haired in what was assumed to be the re-shot first episode, and now blond in what must amount to the second episode after Fairley’s casting. We are, frankly, a bit baffled. Are they planning to digitally darken his hair? Did they try a wig for the re-shoot and have decided to go back to the original beheading sequence which leaves Theon blond? Fans were very pleased by how Alfie looked with the dark hair, so it’s all rather curious. The only other possibility that comes to mind is that the preview was deceptive, that the general darkening made his hair look much darker than it in fact is, although I find this very unlikely. Switch to Jaime, holding tightly to his sister, who’s clearly upset about something. This scene seems to be in King’s Landing: “I’ll kill him. Him, Ned Stark, the king, the whole bloody lot of them, until you and I are the only people left in this world.” It vaguely echoes how ready Jaime is to go to war over Cersei, if needs be, although with some hyperbole that emphasizes his utter devotion to her. Some have read Cersei to be “half-mad” from this scene, and that Jaime comes off as very villainous, but we’re not quite sure that’s the interpretation to take out of it. That he’s comforting her, telling her that he’ll protect her, is true enough. It seems to emphasize their close connection, and the gravity of whatever secret Cersei is frightened of. We’re reminded of the danger Dany’s marriage presents in another scene between Robert and Cersei (possibly the same scene from earlier, where Cersei tries to convince Robert to make Jaime his Hand), as Robert remarks about how everyone believed the Targaryens would rule forever… but there he is, King Robert Baratheon, and now he’s facing the possibility of a Dothraki horde crossing the narrow sea. He doesn’t believe that he can stop them, if they cross, which ... well, that’s a bit of a change, but we assume it’s one to emphasize the threat. So far, the reel’s doing a great job of tying the Targaryen storyline across the narrow sea to the present. 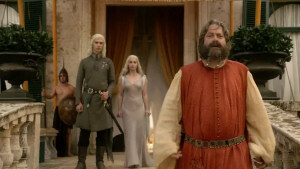 The focus shifts to Viserys at Dany’s wedding, as he repeats a line from the books: “I piss on Dothraki omens.” The nuptial night of Daenerys with Khal Drogo follows, and it’s a heartrending scene as the young Dany is faced by this huge, brutal warrior who doesn’t share a language or even a common culture. Clarke plays her fright very well, with her tear-streaked cheeks; it’s a very difficult scene to watch. It actually _seems_ different from this little snippet—it’s much more frightening—than in the books. Yet ... we have Drogo’s one word of the common tongue: “No.” Perhaps it’s a matter of cutting, and we’ll see the interesting nuances in Drogo that Martin introduces into the scene. Clarke shows real strength in her scene with Viserys as she attempts to make him a gift of Dothraki clothing, which is another scene straight from the books. Harry Lloyd and Clarke play quite well off one another, and Lloyd in particular captures Viserys’s incredulous shock and quite literal fright when his sister finally shows that she, too, is a “dragon”. Her line to Viserys when he snidely suggests she means to braid his hair as well is different from in the book, in that it’s much sharper and stronger than GRRM presents it. In the book, she’s trying to explain, to deflect Viserys’s anger… but here, she throws it in his face that he’s won no victories and merits no braid in his hair. This follows a scene where the viewer is informed, through Dany and Ser Jorah, that Viserys is not capable of leading an army to victory against the Seven Kingdoms, that the prince will never be able to take them home again. 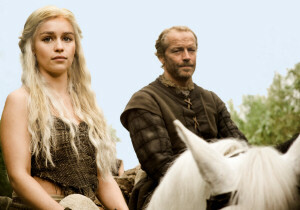 “Wise child,” Ser Jorah tells her, to which Dany responds, “I am no child.” We then cut to Dany in bed with Drogo, and a brief dialog in Dothraki as she informs him that she’s pregnant with a son. He asks how she knows, and she responds, simply, “I know.” We attempted to transcribe the dialog in Dothraki for our fellow fans of the created language, but we simply couldn’t manage it—you’ll just have to wait to see it yourselves! Jason Momoa has a great rumble/rasp to his voice as Drogo, as well. Not a man one wants to be on the wrong side of. The final part of the reel starts with Old Nan‘s voice-over as she tells Bran that he knows nothing of winter. You know how aliens make crop circles? We learn that the Others make corpse circles—very gruesome as body parts are strewn in a strange pattern, and there are a number of severed heads on wooden spikes. This focuses on events beyond the Wall, and the reminder that this is the real threat to the realm—not political squabbling in the south, not a young woman across the Narrow Sea, but these strange creatures who inspired men thousands of years ago to build a wall hundreds of feet high and to man it against their return. We get a glimpse of the Other killing Gared (yes, the executive producers have changed things around a bit, something we learned from an earlier teaser), and Will running away in terror. Yes, we see something of the Other, its creepy bluish-grey hand and what might be a matching armor. This shot also includes a very brief glimpse of his sword before he shoves it into Gared’s back. More about that when we resume our exclusive set visit reports. A quick montage follows. Robert confronts Ned in the small council’s chambers: “You think it’s honor that’s keeping the peace?! It’s fear, fear and blood!” This is a new line, one that paints Robert in a darker light, we think. But in his anger and frustration, it’s quite appropriate that Robert might extend himself into an extreme position when arguing with Eddard. There’s a montage of shots here, including Ned pushing Littlefinger up against a wall with a hand around his throat (this is a scene straight from the book, in Eddard’s first chapter in King’s Landing), a look at the completed dragon skull (not black, as in the book, but massive), a look at Prince Joffrey drawing the tip of Lion’s Tooth against Mycah‘s cheek, and a brief moment of fatherly concern as Ned tells Arya, “I don’t want to frighten you, but we’ve come to a dangerous place.” I believe this may be the scene that George and Parris raved about after they came out of their 20 minute special screening in Belfast, the one that made George and Bryan go on about how talented Maisie Williams is, and the specific line is a compression of a very similar line Ned gives to Arya in the book.